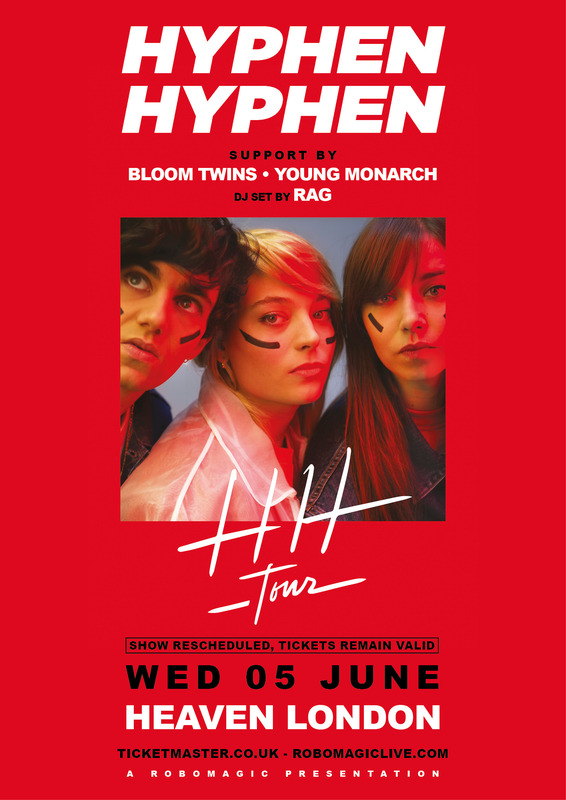 Due to unforeseeable circumstances Hyphen Hyphen have postponed their London date which is to be rescheduled to Wednesday 5th June 2019. Apologies for any inconvenience that may have caused. All tickets remain valid on the rescheduled date. together lyrics rich in meaning (Mama Sorry, Last Call and above all Young Leaders, staggering hymn of a generation both lost and free to change the world). Hyphen Hyphen dances for sure, but with its head full of everything which has made up the period: sexual freedom, the quest for intoxication, ennui and feminism (the unstoppable single Like Boysand its fiery clip). “I love to play with paradox” continues Santa. “I am a fan of Marcia Baila by Les Rita Mitsouko: it is a very dance tune, but with very dark lyrics.We have this ambition to create pop with depth; a pop which keeps its spontaneity but which can also be interpreted on several levels.”Although the group took sole responsibility for the production of its album, Hyphen Hyphen was also able to surround itself with the best: HH was recorded in the Parisian studio of the Air musicians (Atlas studio), where the group was able to make the most of a vast choice of synthesisers and the participation of the drummer, Zoé Hochberg. To perfect her voice, now capable of remarkable acrobatics, Santa called on the talent of the American Guy Roche, the regular vocal coach of the greats (Beyoncé, Mariah Carey, Christina Aguilera, etc.). “Guy drove me to my limits.He put me in a kind of trance so that I could deliver the best performance possible.I ended up doing some previously unheard things with my voice.He was able to exploit all my flaws and make them a strength, therefore leaving behind just the power of theperformance.The mixing of the album was entrusted to Maxime Le Guil, already behind albums by Justice, Radiohead and Morrissey, and the mastering was entrusted to Vlado Meller (an impressive CV -from Kanye West to Frank Ocean, by way of Michael Jackson). Strengthened by this star casting and the immense talent of its authors, HH is an album that is at once powerful and uncategorisable, which resembles nothing that is out there in the modern French landscape. Hyphen Hyphen wanted to win over hearts: withthis second chapter, they will pierce them.